As Division Director of REI, Dr. Hurwitz is responsible for developing and implementing the division’s academic program, teaching residents, and giving lectures, as well as caring for infertility patients. Dr. Hurwitz has been teaching residents at Danbury Hospital in the operating rooms, clinic and RMACT’s private office for over three years, making his transition to director a natural progression. He will continue teaching and implementing the most advanced infertility therapies available, including endocrinological, surgical, genetic and in-vitro fertilization (IVF) techniques. He received his undergraduate degree in Biology & Society from Cornell University, and his medical degree from the Jefferson Medical College in Philadelphia. Dr. Hurwitz completed his residency in Obstetrics & Gynecology at Thomas Jefferson University Hospital, also in Philadelphia. 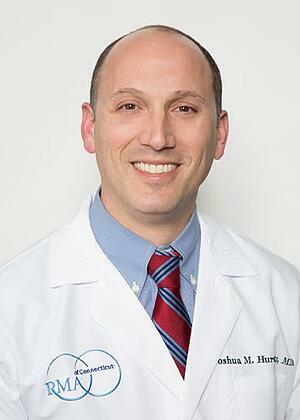 During residency training, Dr. Hurwitz was named Best Laparoscopic Surgeon, and has received many teaching awards. After residency, he completed a three year fellowship in reproductive endocrinology at the Albert Einstein College of Medicine in New York. During his fellowship, Dr. Hurwitz successfully launched several research programs related to reproductive aging and diminished ovarian reserve and has presented his research findings at many leading national and international fertility conferences. His research interests also include premature ovarian failure, oocyte cryopreservation, reproductive surgeries, embryo donation, and bioethics. He has published numerous abstracts, articles and book chapters on reproductive aging, reproductive hormones, IVF, ultrasound, and bioethics.